Just produced, The Attributes of God is a unique new resource from Moody Church Media to help you experience the life-changing impact of God’s Word in your life. 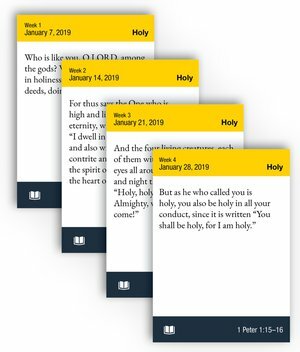 These 52 Scripture meditation cards—one for each week—are designed to focus your heart and mind on God in this new year. Each card presents a specific divine attribute using a verse from Scripture personally selected by Pastor Lutzer. When you use these cards to ponder and adore God for his holiness, wisdom, mercy, love, and more, your own confidence, trust, and love for Him will grow. Every week, Pastor Lutzer will use these Scripture cards in his exciting new program, 5 Minutes with Pastor Lutzer. We’d love for you to join us every Monday as we explore the great and mysterious attributes of God. Please visit www.pastorlutzer.org to follow along.